A small wooden shelter was built in the early 1990s for use by people hiking the trail. It is available for overnight camping on a first come, first served basis. Even if camping is not the intention, it provides a nice destination for a day hike with views of the surrounding mountains and an opportunity to read the Forest Service cabin log to see who else has been by. 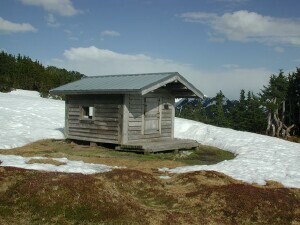 The shelter is often buried in snow through late spring.